All lessons on Spanish Pod101 include grammar points. On the Grammar option, under the Lesson Materials tab, you will find the grammar explanation to each lesson you take. 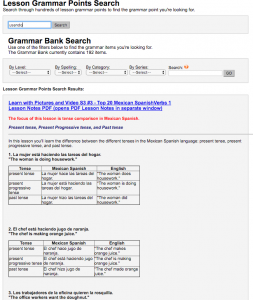 Click on any of the given options and learn more about the Spanish grammar used in your lesson. 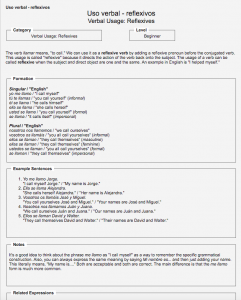 For example, this lesson focuses on reflexive verbs and its uses. It clearly explains the term “reflexive” and it even gives examples in English for easier understanding. It also explains formation (in both singular and plural forms) and adds some very useful examples. 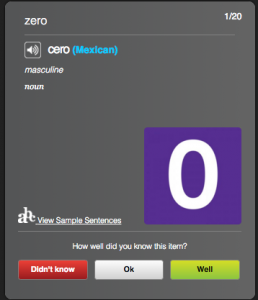 On Spanish pod 101 you will also learn about verbs, adjectives, nouns, names and everything else every time you choose to practice your vocabulary through the helpful tools “Flashcards” and “Word Bank”. Let’s take a look at the “Word Bank” tool. You will find the “Word Bank” tool under the “Study Tools” tab. All the words included on this list have their proper grammar description. You will be able to see if they are nouns (n), verbs (v), adjectives (adj) and you will also be able to recognize their gender: masc, fem. When applicable, the words will also display their origin. Your “Flash Cards”, under the Study Tools tab, is also a great resource to review and learn about Spanish grammar. You will be able to see the grammar information displayed under the word on each card. The Spanish lessons on Spanish pod 101 include more grammar study options on the “Spanish Grammar” tab, under “Spanish Resources”. Some of the tools here include a quick but thorough introduction to “Spanish Grammar”, “About Spanish Verbs” and a “Verb Conjugation Chart”. 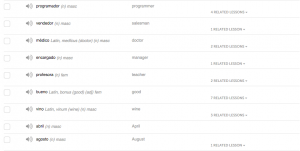 The Grammar Bank, which is my favorite, is an amazing tool where you can search for the exact word you are looking for. Just write the word in the “Lesson Grammar Points Search” search box, click search, and you will see the display with all the information. It will highlight the word you are searching and give you translation, tenses, and more. You can also use the provided tools to refine your search.